Pages are static web pages that do not change often. Unlike the Post entries, they are not a part of the archives or sorted by category. Generally, you will only need a few pages, and most of the content will be added as posts. Examples of pages include: an About page to share some information about your organization, a Contact page to let visitors know the best way to get in touch with your group, or a Membership page where others can learn how to join or volunteer. A page would also be a good place to share photographs, documents, or other files. To create a new page, in the Dashboard click the “Write” tab and then click the “Write Page” Tab. Give your page a title. The title will be used as the link to the page, and the headline of the page. 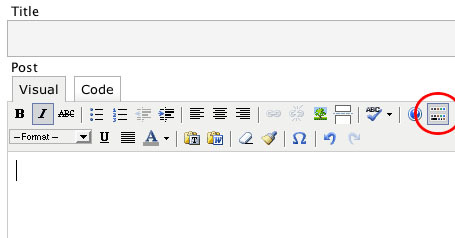 You can write the contents of your page in the box below the toolbar. To save your work as you go, you click the “Save and Continue Editing” button below the text box. If you would like to save a Page as a draft and complete it later, click the “Save” button. When you are finished with your Page and you would like to make it live, click the “Publish” button. To edit or delete an existing Page, click the “Manage” tab, and then click the “Pages” tab. From the list of pages, click the “Edit” or “Delete” button behind the Page that your would like to change.